The Veil of the Virgin Mary represents the mantle of the first human who has been raised to the rank of God. The Blessed Virgin connects strongly earth with Heaven. She helps us to remember we are the People of God whether alive or dead, and the Cathedral is its home. 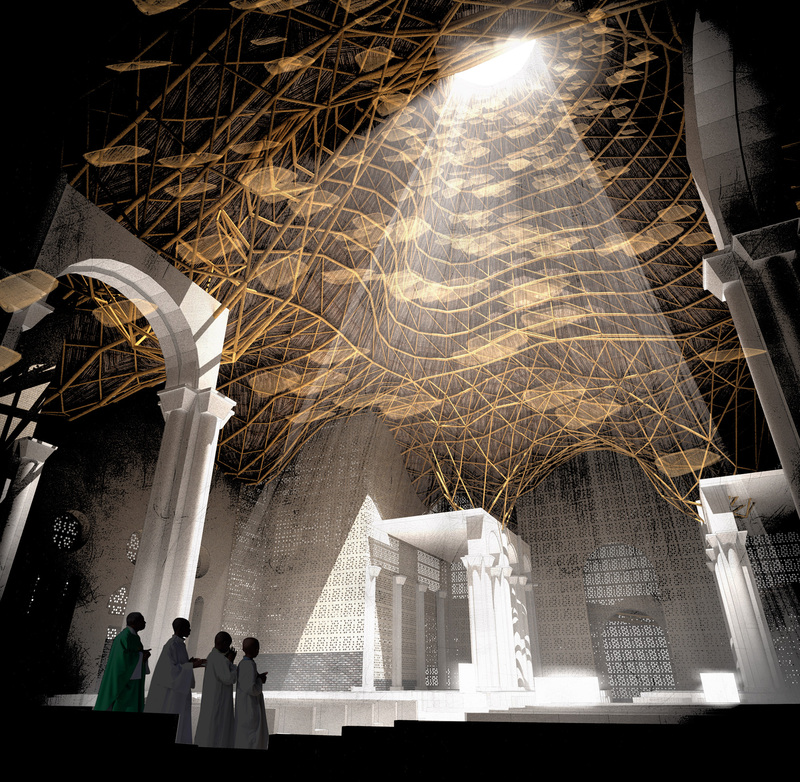 Symbolically, the roof represents this Veil. 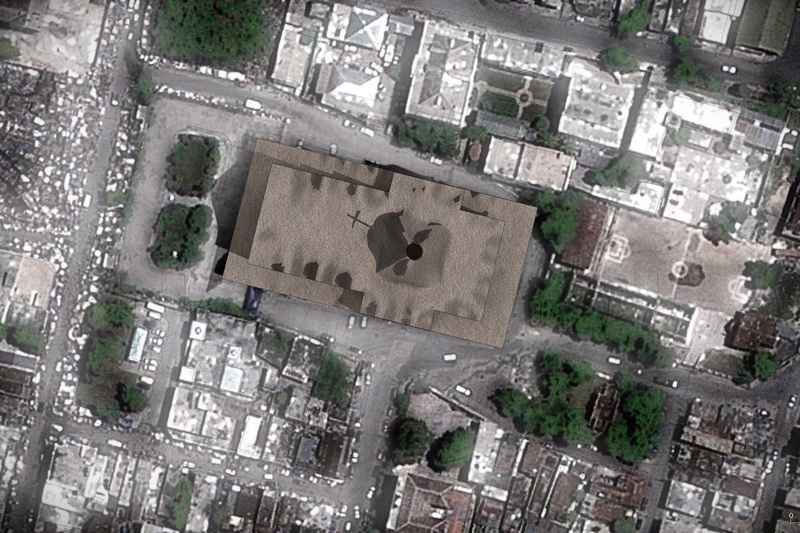 It waves with some reminders of the past vaults, and is a new symbol of Port-au-Prince. 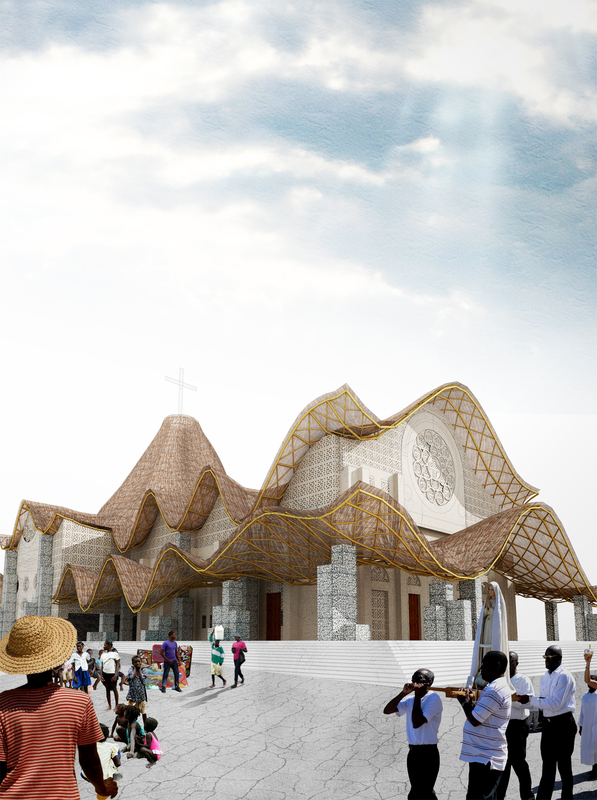 The new cathedral is a bamboo manifesto, as an example of what new design should be in Haiti. The freestanding structure of the roof is entirely made of bamboo. 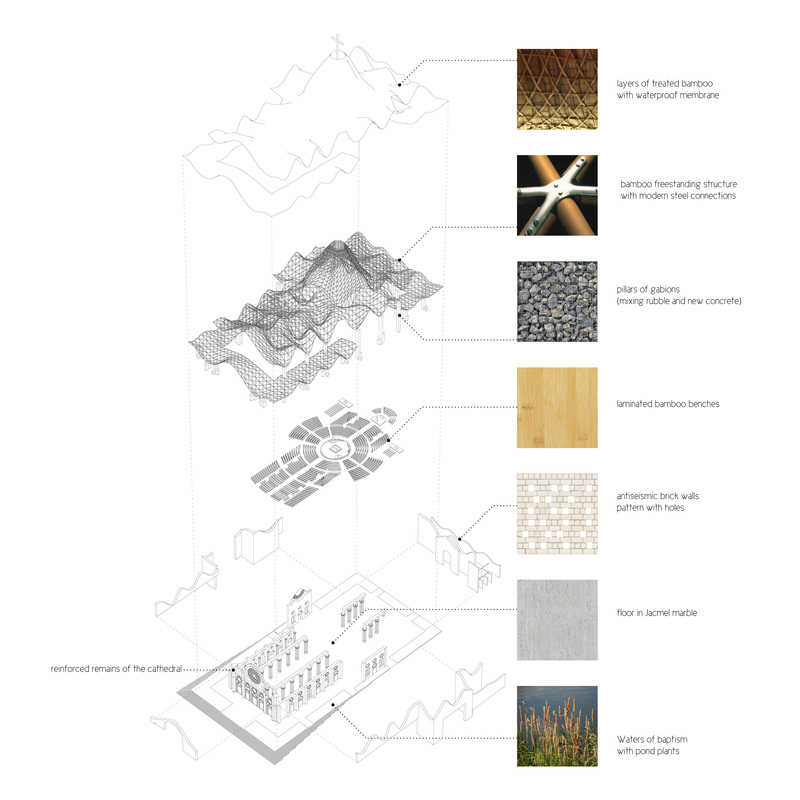 This eco-friendly building material grows fast (30 meters in five years), the CO2 balance of its production is clearly neutral, its density is very low (300-400 kg/m3) and is therefore both very rigid and flexible; enough to withstand any seism. 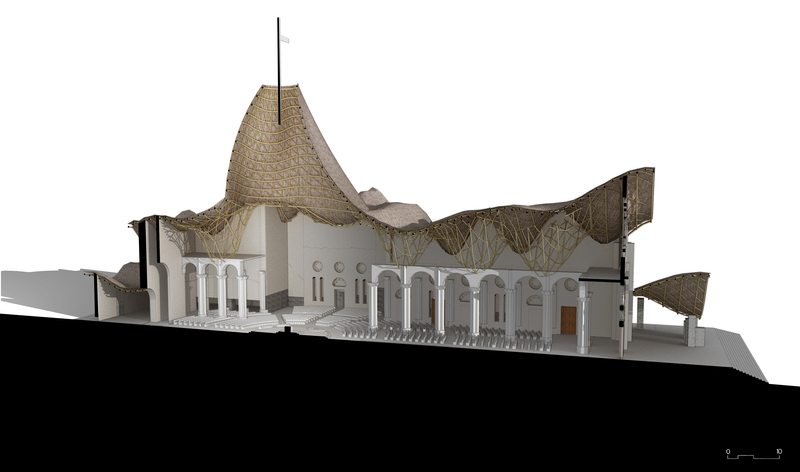 We suggest the Archdiocese would build a bamboo nursery with the aim to build the Veil of the Virgin Mary with a local material. This roof structure stands on outside pillars of gabions. The gabions mix concrete rubble and new concrete. They represent our life changed by God who creates hope from ashes.The envelope is a combination of the remains of the cathedral and new walls. Those are not more structural but they are reinforced. The new parts consist of anti seismic brick walls (double layer bonded inside with a concrete structure); a particular pattern leaves irregular holes. The surrounding water and the conic shape of the bell tower cools down the air coming from the outside. The pathway is full of meanings. In order to get inside the cathedral, you first have to walk through the waters of baptism that surround the building. Then you go through an outside narthex under a canopy where will stand a place in memory of the victims of the 2010 earthquake. Past the narthex, you are to walk through the door to reach the nave. From there a bright place draws your attention and that is the Choir. This latter is under an alone oculus, made of stained glass. Everything inside faces the altar. Further on, on the axis, is the Blessed Sacrament chapel. Two other chapels can then be seen: the Holy Mary Chapel and the Saint Trinity Chapel. 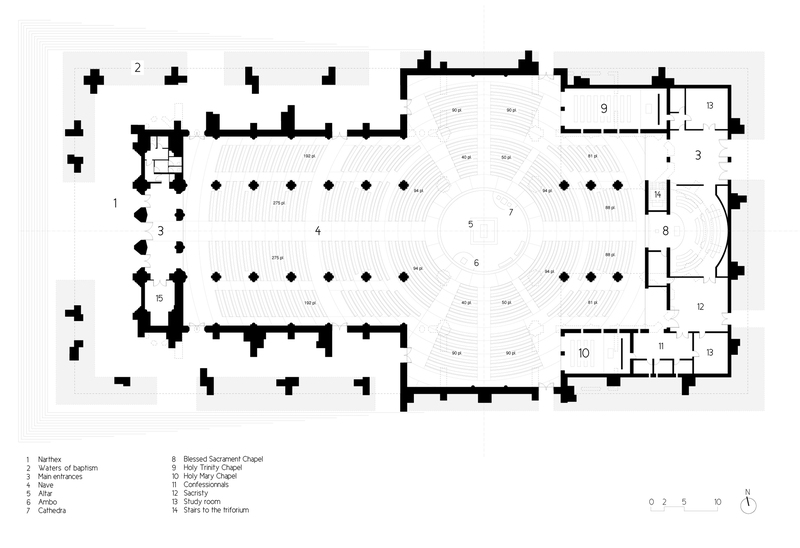 The expected area is nearly respected (90x40 m), nonetheless two exceptions have been made: in the east wing, new rooms would be available (reconciliation place, sacristy, bible study, toilets) so as to make the place more cheerful. Therefore, the plan would exceed the 2200 seats (1500 expected in 25 meters away from the altar).